Deputy Prime Minister Tan Sri Muhyiddin Yassin held a meeting with Indonesia's education and culture minister, Anies Rasyid Baswedan, and research, technology and higher education minister Muhammad Nasir. Bernama photo. JAKARTA: Efforts are underway to create a common lingua franca, the Bahasa Melayu-Indonesia, for Indonesia and Malaysia to better communicate and interconnect with one another. Deputy Prime Minister Tan Sri Muhyiddin Yassin said the two languages had many similarities since they both come from the same root. "It will be our language of communication and will help improve further our diplomatic and bilateral ties," he told reporters here today on the second day of his working visit to the Indonesian capital. Muhyiddin, who is also Education Minister had earlier met with Indonesia's education and culture minister, Anies Rasyid Baswedan, and research, technology and higher education minister Muhammad Nasir. Also present was the former minister of Information, Communications and Culture, Tan Sri Rais Yatim. 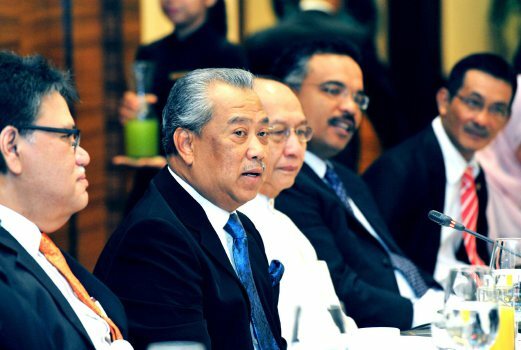 Muhyiddin said Rais, as the point man for the initiative, was tasked with the setting up a technical committee to get language experts from both countries to study the matter, adding that this initiative had been discussed some time back, but never came to fruition. It was also reported earlier that Rais had said Indonesia, Malaysia, and Singapore were under one family when historical roots were examined. Therefore, many similarities could be found because intermixing has occurred for a long time. Besides the common language, Muhyiddin said they also discussed cultural cooperation between the two nations and the authorisation to set up community learning centres for children of Indonesian workers, especially in Sarawak. At present, there are 50 such centres in Sabah. He also said they agreed to expand cooperation in students and teachers exchange programmes in all aspects including in research and development. On his meeting with Indonesia's vice-president Jusuf Kalla, Muhyiddin said it was mostly to follow up on what was agreed between President Joko Widodo and Prime Minister Datuk Seri Najib Razak during Widodo's visit to Malaysia in February.